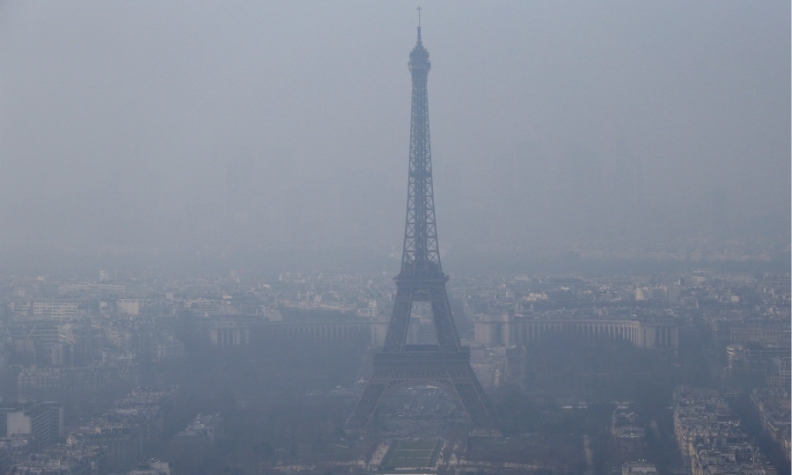 Paris is shown under a haze of smog that is partly caused by vehicle emissions. PARIS -- Paris launched a new color-coded sticker scheme to restrict car use in its latest attempt to reduce air pollution many citizens blame for coughing fits, eye irritation and runny noses. The "Crit'Air" system bans all diesel-fueled cars registered between January 1997 and December 2000 - identifiable by a grey sticker on the windscreen - from the capital. About 6 percent of France's 32 million cars fall into this category. Paris Mayor Anne Hidalgo said she hoped to get the ban extended from Tuesday to vehicles registered between 2001 and 2005 - color-coded brown and comprising 14 percent of France's car fleet - to better fight the smog problem. It was not clear whether a final decision had been taken by late on Monday. Pollution from vehicles in the city often builds up into a greyish haze over the city and is becoming an increasing concern to local health authorities. "I can really feel the pollution. I have young children and I can see it on their skin and hair. It's such a shame that in Paris, which we call the City of Light, we're not able to fix this problem," one Parisian, Marie, told Reuters. "I never cough but today I've had coughing fits, I have a runny nose, it's really not nice," said Henriette Robine, another Parisian.